Over the last few years, I have immensely enjoyed receiving my Better Homes & Gardens magazine and flipping through to see how many bloggers I know! Turning to the back cover and looking at the “I did it” feature reveals a fellow friend and blogger well over 60% of the time. Yay for bloggers and yay for magazines who feature bloggers! For many of us who blog professionally, being featured in a national magazine is a fun “feather in the cap”. I have been so proud of all of my bloggy friends and colleagues and all of their many “feathers”! I’ve been featured several times on BHG’s online site, but I’ve never had the honor of being in print. Well don’t blink because you might miss me, but I made a very teeny-tiny cameo in the August BHG. 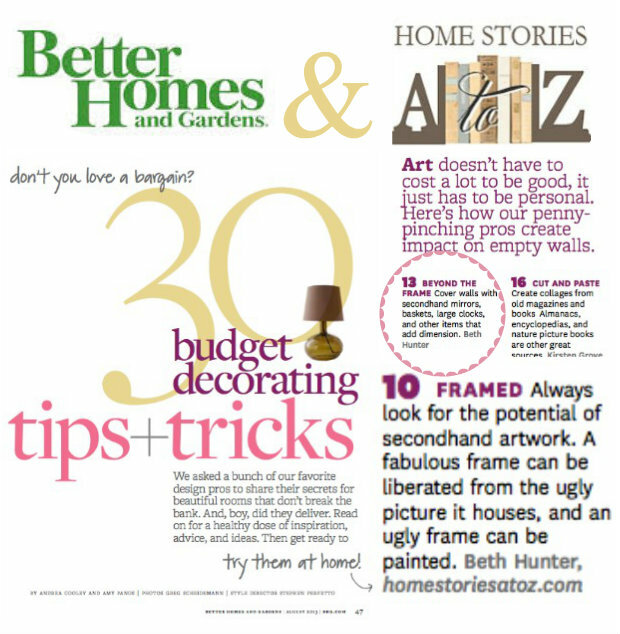 You can find my tips in the article, 30 Budget Decorating Tips & Tricks. Yes, I wish it was my kitchen being featured instead of my tips, but I’ll take it! It’s also fun being in the same article as my good friend’s Sarah from Thrifty Decor Chick and Melissa from The Inspired Room. The article is bursting with bloggers, so be sure to notice! Also in this issue is my lovely friend Sandra from Sawdust Girl and her daughter’s room makeover! 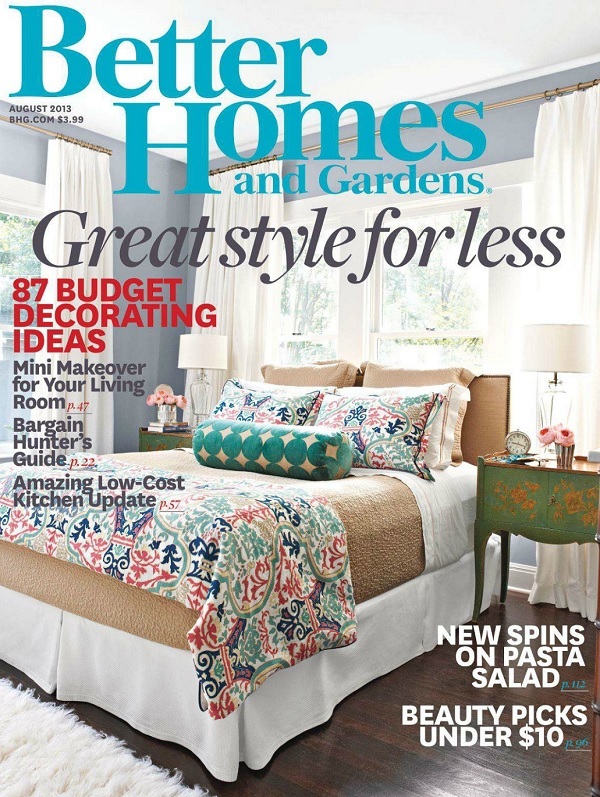 The August issue is BHG’s budget decorating issue, so it’s filled to the gills with bloggy goodness. I’m so glad that our niche continues to receive national recognition for all of our hard work, tips, and tutorials! Keep it up DIY/Home bloggers, and thank you magazine editors for noticing :). That’s not a baby feature – it’s legit! Totally counts! Congratulations! I just got my issue and haven’t had a chance to devour it yet. 🙂 BHG is SO awesome for working with bloggers. I loved seeing your sweet laundry room :). Such a thrill to see rooms I’ve featured end up in the mag! Thank you Jennifer. It might be a baby feather but I’ll take it and wear that feather proudly ;). How cool is this??? I just picked up the August issue. I can’t wait to say I “know” the author of the article! Thank you so much Suzi!! I saw it, Beth! I’m always excited to see names of people I “know.” Good for you! I was recently featured on BHG.com for my fall mantel but to be in the print version is the REAL coup. Awesome! Congrats Val! Yes, BHG is great with their blogger mantel features! That’s so awesome Beth! Congrats. I have to ask though, Do the magazines take the content off your blog and add it to the magazine? Do they contact you first? Just curious if it’s a surprise or you know it’s happening. We’ve had scouts contact us lately to shoot our homes but Mom and I laugh because our homes aren’t even close to ready yet. We politely declined and promised to keep in touch when our homes are ready. Yay! Beth. So exciting! Can’t wait to congratulate you in person very soon! So wonderful how BHG features bloggers. I saw you there! And Sandra too. Funny how blogging turns you into just a little bit if stalker. But a friendly one 🙂 Just wrapped the photo for the Oct “I Did It” and I am almost unable to contain my excitement at actually seeing it in print. Such fun. I’ll have to check it out. Congratulations! Woo-hoo! We all know how FAB you are!!! It’s nice that BHG has finally featured your awesome talents in print, though you rock their website! Congrats! You go girl! Way proud of you! Yay this is so exciting Beth!! Congrats! I caught that when I was reading BHG yesterday! I always get excited when I see something from “my bloggers” — my hubby thinks I’m crazy with all my imaginary friends! Ha! So does mine Nancy. I’ll always grab a shelter mag when we’re in line at the grocery store and show him some pic or another and squeal, “EEK! I know her! Well…kind of. I read her blog!” He rolls his eyes at me.